At Metropolitan, we can supply all equipment needed to keep your pump station functioning as efficiently as possible. Our adaptability and knowledge of new technologies give us the ability to supply the most cutting-edge equipment, which can extend the life of a system and save end users funds. We recently supplied equipment to two pump stations with the end goal of bringing up to date, cost-efficient solutions to our customers. Metropolitan supplied all equipment for the upgrade of the Joe Orr Road Lift Stations of Chicago Heights, IL. Metropolitan was chosen to supply all equipment associated with the upgrade of the existing Stormwater and Sanitary Lift Stations for the Joe Orr Road Lift Stations of Chicago Heights, IL. The new lift stations include a number of up to date accessories and were housed in a large pre-fabricated concrete building. Metropolitan’s Bob Wedell said a number of factors contributed to the customer’s decision to make the upgrades. The pre-fabricated concrete building measures at 20’ L x 8’ W x 9’ H (outside dimensions). The building is comprised of a 36” x 84” single door for the control room and a 72” x 84” double door for the generator room. A Caterpillar 55kW rated generator was also included. Wedell said the way in which the total system operates makes the application distinctive and efficient. Wedell said Metropolitan’s involvement in the project can be attributed to a long standing relationship with the City of Chicago Heights and project engineer. 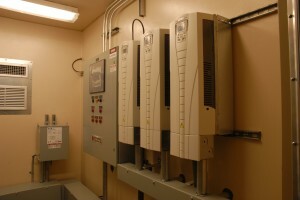 Pictured are controls supplied to the 71st Street Stormwater Pump Station in Bridgeview, IL. Metropolitan was also chosen to supply equipment to the 71st Street Stormwater Pump Station in Bridgeview, IL. 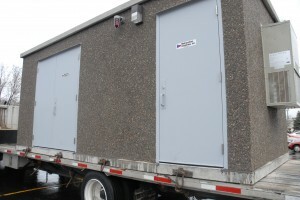 The control and power distribution equipment was housed in a prefabricated concrete building with outside dimensions of 10’6” in length and 10’4” in width. Three Hydromatic model S12L4000 non-clog pumps with 100’ cords and silicon carbide seals were supplied. Each pump has a capacity of 3142 GPM at 29.2’ TDH for a total pumping capacity of 9,426 GPM when operation in parallel. Each motor is rated at 40 HP, 1150 RPM, 460 volts, 60Hz and three phase. A 125 kW natural gas, sound attenuated, Caterpillar generator was also included in the equipment package. Wedell said Metropolitan was contacted to take part in the project at the project’s inception and that the eventual place where the building would be placed and function had much to do with its overall design. Wedell said additions of variable frequency drives and enhanced controls with SCADA components will provide the municipality with both energy efficient operation and alarm notification if procedure encounters a malfunction. For more information, please contact Bob Wedell at 815-886-9200, ext. 262.